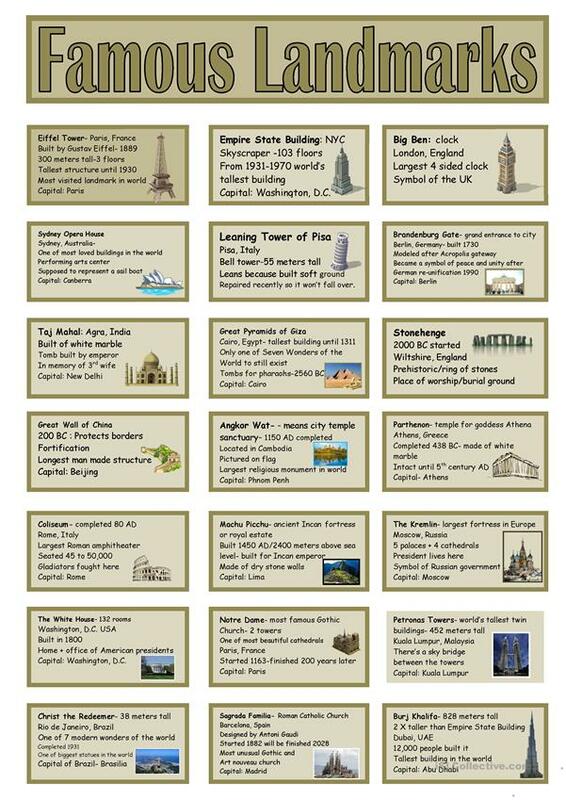 Famous landmark cards with fun facts to be used with World Capitals and Disasters Boardgame or for vocabulary development/speaking activity. Students should learn and discuss about famous world landmarks and natural disasters plus a review of world capitals before playing the game. This printable, downloadable handout is recommended for high school students and elementary school students at Pre-intermediate (A2) and Intermediate (B1) level. It is excellent for honing your learners' Speaking skills. It centers around the theme of Countries, Environment, London and Places. There is a key provided with the exercises. kifissia is from/lives in United States and has been a member of iSLCollective since 2011-10-12 07:37:58. kifissia last logged in on 2019-04-22 01:52:39, and has shared 385 resources on iSLCollective so far.